Oh Dracula. Bram Stoker’s Dracula is perhaps the pinnacle of Gothic literature. Anyone who studied the Romantic Gothic period of English lit knows that this is a staple story for students. But, now take that book and the story it has and throw it out the window. 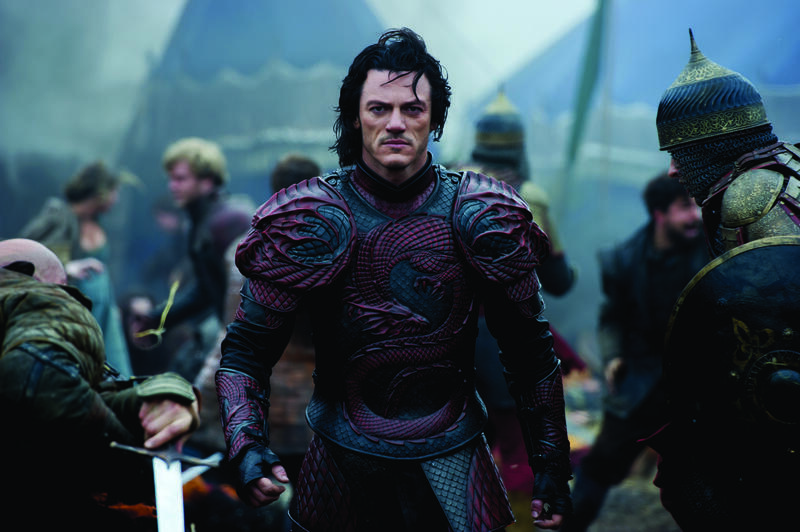 Although Dracula Untold is based on Stoker’s tale, it is a loose representation and takes on its own rendition of the classic story. Of course, this isn’t a bad thing. A lot of critics are going to say this movie is boring or it lacks appeal. But as a person who loved Van Helsing when it came out in 2004 and I was a pre-teen, this movie was a major throwback to that style of movie. As far as vampire lore goes, this did a great job. I am always interested in seeing how directors and storytellers reinterpret the birthing of a vampire. In this case, a man named Caligula (I think this is the Caligula? Wikipedia tells me this, but I do not remember him even having a name in the movie) played by the awesome Charles Dance, made a deal with the devil to get revenge on his enemy and instead was tricked. He offers Vlad aka Dracula a taste of his blood and his power, which he will keep for three days, in order to win his war against the Turks. If he resists human blood during these three days, he will be turned back into a human, if he doesn’t he will be turned into a monster. Obviously in the last moments Vlad is forced to drink blood and turns into the vampire. While his vampire doesn’t sparkle in the sun, he does control the weather? In a final show down between him and his enemy, he brings with him a storm and a whole army of recently turned vampires. As far as vampire stories goes, this has it all. It has romance, it has man turning into bats, it has villagers setting him on fire, it has deals with the devil, it has reincarnation. If you’re looking for an Oscar winning movie, you were kidding yourself the minute you walked into the theater. But if you want entertainment? You are in the right place. 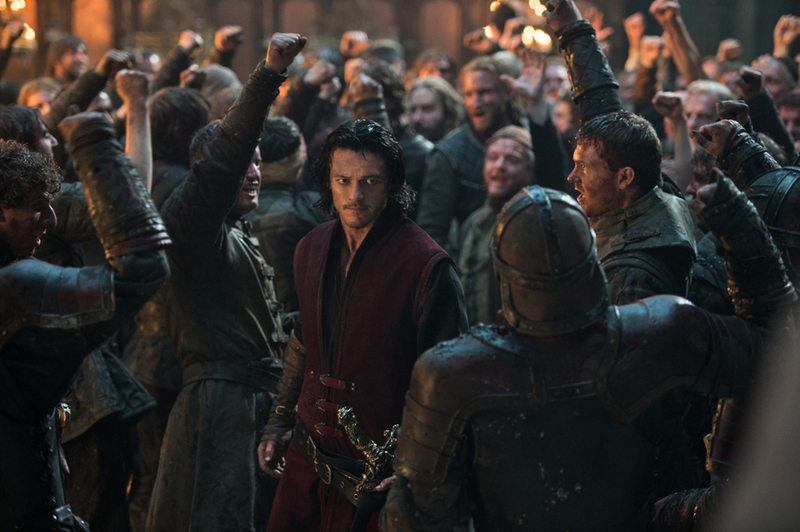 Dracula Untold does a good job of mixing brooding main characters with beautiful action scenes. The only real complaint I have is in the end, when we do a dramatic jump into the modern age, where we see Vlad walking the streets of a city and finding the face of his wife reincarnated into a woman named Mina. All of this is fine. I love this. It has an unintentionally humorous rom-com feeling, but for a guy who spends most of the movie brooding and in pain, it’s nice to see Luke Evans use his smile. But then, it pans to a modern Charles Dance aka “Caligula” who remarks “Let the games begin”. What? What games? It was certainly a WTF moment, that left me laughing for a few seconds as the credits rolled. I’m not really sure where they are going with that, since it was up in the air about who Caligula’s nemesis was. I can only assume it was someone related to Vlad, like his father or grandfather, but alas, we’ll never know. As far as that hitch, it was an enjoyable film. The cast certainly helped. It felt like everyone on a big name franchise was taking a break and just doing a fun movie. From Luke Evans finishing up The Hobbit to Charles Dance and Art Parkinson finishing up Game of Thrones or Dominic Cooper before preparing for Agent Carter and Zach McGowan before Black Sails. The cast do their best, and don’t ever really disappoint. Zach McGowan plays a gypsy chief named Shkelgim, who goes from mysterious gypsy to Igor in an hour. Art Parkinson has more lines as Vlad’s son than as Rickon Stark did in four seasons of Game of Thrones. Luke Evans’ titular character was perfect for me. I love/adore Gary Oldman’s Dracula as much as the next guy, but there’s nothing wrong with a re-imagination. Vlad is suppose to be brooding and dramatic. His story matched the tone of the Gothic. Plus any excuse for me to see Luke Evans on the big screen is not something I will say no to. Story aside, the visuals and sound are fantastic. With Ramin Djawadi back at the helm of composition, the movie sounds absolutely epic. The graphics are gorgeous. The sweeping landscape shots are to die for, not to mention the awesome sequence of Dracula controlling hordes of bats. It is a very pretty movie, and one that should be watched in IMAX if you are able to. 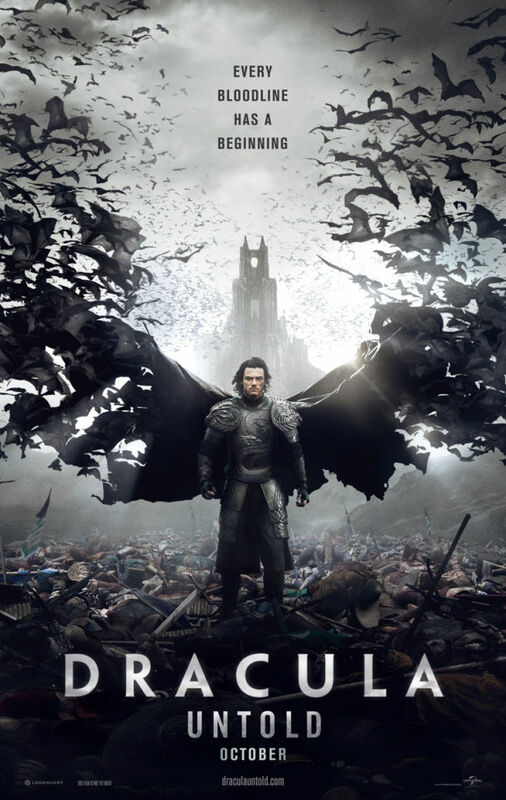 Final Thoughts: Forget the high-browed critics, if you enjoy an entertaining film, watch Dracula Untold for a fun movie in the theme of Halloween and vampires who drink human blood and sizzle in sunlight. If you want quiet moments of contemplation, go to another movie. Luke Evans and the rest of the cast do a great job in retelling a tale that I thought I was already sick of hearing about. I like your point that we need to enjoy a film (like this one) just for entertainment value and not try to analyze it so deeply. I haven’t seen since it was released, but I enjoyed Van Helsing (I was a college student and starting to get back into monster movies). My only real complaint is that I am sick of origin stories. Batman Begins (which was fine), two different Spiderman movies, Man of Steel, Gotham, etc etc… This new feature of focusing on the origin almost exclusively is running a little thin for me. Great review! Yeah, there are a lot of origin movies, but I enjoyed this one like I enjoyed the Van Helsing movie, which I would have considered something of an origin movie.